Indian diaspora has had a complex and multifaceted role in catalyzing, justifying and promoting a transformed urban landscape in India. 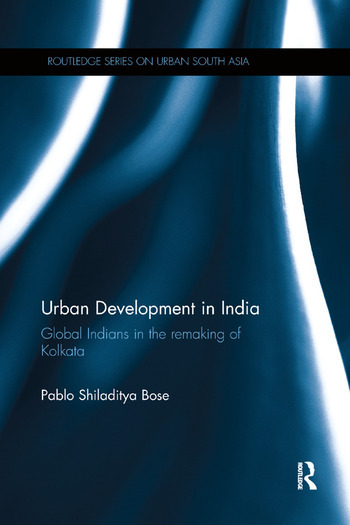 Focussing on Kolkata/ Calcutta, this book analyses the changing landscapes over the past two decades of one of the world’s most fascinating and iconic cities. Previously better known due to its post-Independence decline into overcrowded poverty, pollution and despair, in recent years it has experience a revitalization that echoes India’s renaissance as a whole in the new millennium. This book weaves together narratives of migration and diasporas, postmodern developmentalism and neoliberal urbanism, and identity and belonging in the Global South. It examines the rise of middle-class environmental initiatives and Kolkata’s attempts to reclaim its earlier global status. It suggests that a form of global gentrification is taking place, through which people and place are being fundamentally restructured. Based on a decade’s worth of field research and investigation in multiple sites - metropolitan centers connected by long histories of empire, migration, economy, and culture - it employs a multi-methods approach and uses ethnographic, semi-structured interviews as well as archival research for much of the empirical data collected. Addressing urban change and policies, as well as spatial and discoursive transformations that are occurring in India, it will be of interest to researchers in the field of urban geography, urban and regional planning, environmental studies, diaspora studies and South Asian studies. Pablo S. Bose is Assistant Professor in the Department of Geography at the University of Vermont, USA. He is an urban geographer and interdisciplinary scholar with interests in urbanization in the Global South, environmental displacement worldwide, and migration and refugee resettlement in North America.